Kumara Parvatha Trek Ascent -2 : Bhattaru Mane to SeshaParvatha ~ The Wandering Soul's Wander Tales..
We left our entire luggage and resumed the trek at 1.30 PM with just water to drink as there are no water sources till the top. There is one stream supposedly near Mantapa but who knows what flows there. It’s not a major stream. We had to stop at forest office to pay some charges to enter the forest and off we go again. 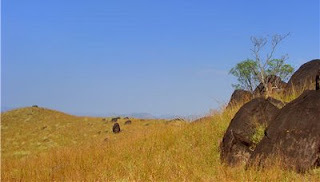 We were crossing small hillocks, grasslands for most part and the sun was shining high up in the sky scorching us. After crossing a few hillocks we reached a point where the ascent was steep and seemed endless. No more plain lands in sight. Tough part starts again we thought although totally ignorant of the beating we were about to take from nature! Now the best part or the worst part (as it seems more apt) is the never ending series of peaks to the top. And it is not like you always have a full view of what is in store for. You see a peak, trek to its highest point only to realize the peak continues up from there and you trek to its highest point again and again realization strikes! Its like mirages, the closer you seem to get the farther it seems to be. 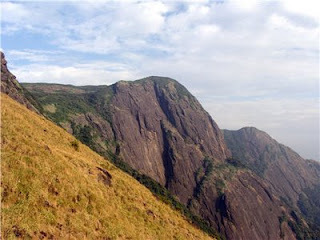 All these difficulties make KP trek one of the most arduous yet rewarding treks around Karnataka! It was close to 2.30 PM and we hadn’t covered much ground. KP was still far far away. Even Mantapa was no where in sight. It wouldn’t be an exaggeration if I said the four of us were crawling at snail pace up the mountain. The thing is all four of us were novices when it came to trekking. This was our first trek for crying out loud! (Well second if you consider Skandagiri :P) And I bet I couldn’t have been more deranged for having chosen KP as our first! Not all in the group of 30 were getting ahead. Many were trailing behind nurturing thoughts of staying put at first sight of even an ounce of shade. Once you get past Bhatta’s house there’s not a single tree in sight. Its all open grasslands. The sun shines very brightly and literally scorches. We were dehydrating very rapidly and there was no shade to take rest either. And if we stop to take rest you could feel the full force of the heat so even resting was not an option. Out of 30 who set out earlier that morning only 18 were still on track..rest had either stayed back at Bhatta’s house or were resting on the way, already given up. And then finally at around 3 PM Mantapa was in sight. Some relief at last we thought. Right there was a small water stream flowing with some shade around it. That small shade was like heaven for us. Pavan refused to move an inch from there and asked us to go ahead. By then even Asha was tired out totally and she also decided to stay there. But I persuaded Asha to come further as much as she can. All three of us started yet again. By now, we three were totally lagging behind. Some were resting under the shade and others had already crossed mantapa to reach the next hillock. Slowly again, fighting the sun and the fatigue we were crawling up the hill. The ascent was very steep here while mantapa was in sight. With great difficulty, we reached the top of this hillock only to find one huge mound ahead of us. That’s where Asha and Krishna also gave in to the cries of their tired bodies. I was also equally tired but I felt so guilty for dragging the three poor souls along with me to this trek and not even completing the trek would totally defy the purpose and all their efforts would be wasted. So got myself up to the task. There were five more people resting in the grass. One of them was still in mood to trek. So we both thought lets at least climb the mound ahead of us. But once we reached the top we found a trail on level ground leading us to another peak. So we proceeded to wards the other peak. This as it turns out leads us to the foot of Sesha Parvatha. And to our surprise we found the rest of the team resting among the rocks at the base of Sesha Parvatha. The thing was that, the team’s speed was grossly under-estimated. So by the time we reached the foot of it, it was already 4. And if we chose to continue to KP which is just 2 kms approx from there, we would be stranded in the darkness by the time we start descent. And as fate would have it, we left our camping gear and torches at Bhatta’s place. So the forces of nature had gloriously defeated us! Sulking and seething that our destination was tantalizingly close, yet happy and proud that we could make it this far at least in perfect shape, we started the journey back to Bhatta’s house. its just not possible to start from girigadde at noon, go till KP and come back by evening ... unless its a small lean team. 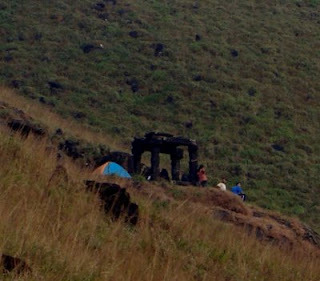 we camped at mantap, went up and came back all the way to kukke the next day. it was a team of 15, including some really slow trekkeres. In retrospect, that was the only plan which would work. i know! we didn't realize this when we started the trek. We had no option of camping at Mantapa either coz we were 30! I guess starting from Bhatta's house early in the morn to KP and back would be good plan to escape the heat and the luggage too.. I was also having feeling its a bad decision to go to KP the same day. But its hard to ask everyone to go till mantapa with luggage and tents.. Also I was not sure if everyone was in a position to help in cooking and stuffs too.